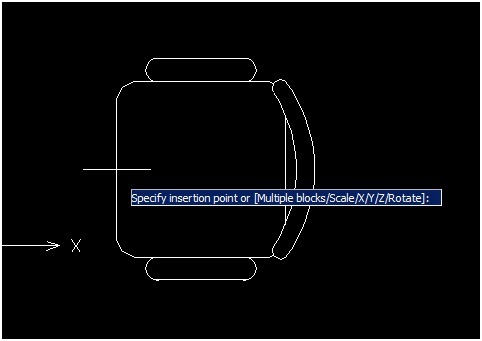 In our daily drafting work, it is common for usto insert blocks of common parts. For example, architects use standard blocks of desks, tables, beds, and other furnishings in their drawings. Mechanical designers employ blocks like screws and nuts for their designs. There is, unfortunately, no block manager in ZWCAD (for the time being); how can one manage blocks so that one can easily access them when needed? Two solutions are the Design Center and Tool palettes. These arereally good ways to manage large collections of blocks. You can easily collect blocks from other drawings with Design Center, and then you save all of them in a single category – kind of likeusing a block template or block library. To insert ablock, just find the right one in Design Center, and then drag it into the current drawing. It’s that simple! As well, you need to set the scale factor and specify the rotation angle through prompts, as illustrated below. As the alternative, you can use the Tools palettes to achieve a similar thing, except that you can create categories of blocks. Drag the blocks that you use often into the Tool palettes, segregating them by categories.For example, you might create a new palette named “Architecture,”in which you save all of your commonly-used architectural blocks; create another one for standard mechanical blocks. Add blocks to the two categories, and then when you need one, just drag the block into the drawing, moving the mouse to the place you want ZWCAD to insert the block. After this, it works just like Design Center. Finally, I want to introduce you a third option. I think it is more convenient than the other two, because you don’t need to open the Design Centeror Tool palettes, leaving the ZWCAD drawing area free with the maximum amount of working area. What’s more, you can use the blocks just as if they were internal blocks, which means you specify the settings using the Insert Block dialog box -- instead of the command line. 2. Erase all visible objects in the template drawing, and then save it. 3. Switch to theworking drawing in which you wish to insert one or more blocks. 4. Use the Insert command to insert the entire template drawing as ablock. 5. Although no objects can be seen, thedrawing has been added as internal block. To see this for yourself, runthe Insert command, and then check that the template drawing is now available. 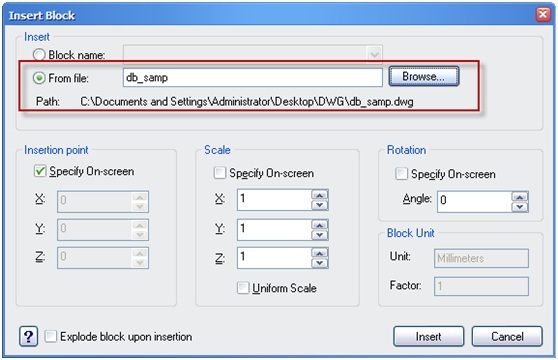 For example, I inserted thedb_samp.dwgdrawing file as ablock, and it appears in the Insert dialog box, as illustrated below. 6. At this point, all the blocks defined in template drawing are not available to you in the current drawing. Here is the reason why: to ensure the best performance, ZWCAD sets thedefault value ofthe _zw_xtinsertdwgref system variable to off. If we want access to all of the blocks inside the reference, then we need to turn on this system variable. To turn it on, enter the SetVar command, then enter the name of system variable (_zw_xtinsertdwgref), and then set it to On, as illustrated below. This is a global system variable: Once it is turned on, it is effective for all drawings. Even when you restart ZWCAD, the value does not change-- until you change it manually. 7. 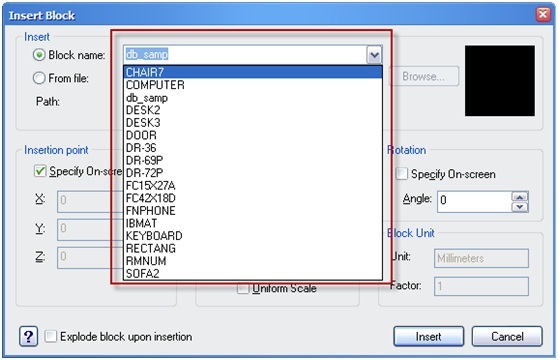 After changing the setting of the system variable, insert the template drawing as a block, and you will find that all blocks are now available. You can insertthem like internal blocks. 8. When you finish making the drawing, it is a good idea to use the Purge command to delete allun-used blocks to reduce the size of the drawing file. By the way, I found that this system variable has been available only since ZWCAD 2011, so if you would like to use it, you will need to upgrade to ZWCAD 2011 first. Very few people know about this system variable and its usage. I suspect there may be more hidden system variables that are not documented. If you find some of them, please share them with us.